The role of the strategy officer is rapidly evolving. Expectations are rising, yet changing industry landscapes, emerging disruptors and well-funded startups with aggressive business models puts significant pressure on the role. It is vital for companies to understand the four different roles for the Strategy Officer. Does your company? 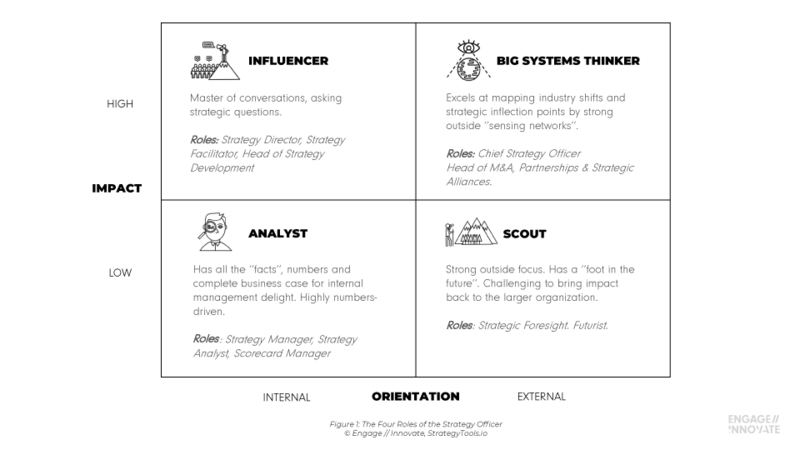 In our work with hundreds of companies and dozens of strategy officers, we have come to identify four significant roles for the strategy officer. We believe it is critical for companies to understand how their specific strategy function works and how they can improve it in the face of emerging competition and significant change. The Influencer succeeds by creating internal momentum for strategy. This might include sparking key conversations, framing new strategic questions, instilling a sense of urgency, of curiosity within all levels of management ranks. He acts as a coach, a facilitator and networker internally. Strategy workshops might have very experimental formats, few slides and never have any answered prepared in advance to be presented. He cares deeply about creating shared understanding across complex issues, often simplifying the complex into easy-to-grasp key issues. The influencer is a master of conversations. Fred, a long-time client of ours, often prepared his management strategy workshops by asking three advance questions, often framing the questions in a highly challenging context. “What would happen if our market fell by 45% in 90 days?”, or “What if Russia shuts us out?”. While strongly divergent from daily operational issues, the reframing of potential strategic issues, helped expand the thinking and open for radical threats, scenarios and, eventually, strategic moves by the company’s legacy business units. The Big Systems Thinker has her focus far outside the home organization. She lives by strong external orientation. She spends 80% of her time on external partnerships, alliances, mapping out M&A prospects and closing deals. She has strong relationships with key stakeholders across the landscape, sensing changes and disruptive trends long before they fully develop. She excels at sensing potential industry scenarios 20-30 years ahead. Mapping industry shifts and strategic inflection points are just a normal part of her job, giving rise to her role as a complex, Big Systems Thinker. She works closely with emerging startups, VCs and technology investors to have a first row seat to the next generation of companies to watch. The Big Systems Thinker is a master at sensing the future. A European media company brought in a former VC and technology founder to help develop an aggressive growth strategy. His network and access to emerging startups on the US west coast, was a large part of why he was hired. Starting in the role, it became apparent his thinking was just too far ahead from the main engine and current focus of the company, eventually leading to his departure in less than 15 months. The Analyst is the brainy, educated, numbers person. He is driven by getting tangible facts, allowing for conclusions and clear recommendations. The analyst writes complete business cases to be presented in complex and lengthy slide decks. He might be oblivious to social influence and stakeholder management as a long as he’s getting his analysis right. If leading the strategy process itself, the analyst’s focus is getting all the facts into organized slides. The analyst is also likely to hold the role of Balanced Scorecard Manager, having a highly numbers- and metrics-driven approach to strategy execution. The analyst is a master of getting the current facts and numbers right. We frequently encounter Analysts, tasked with writing the perfect business case for the top management’s consideration. Basic concepts like customer discovery, business model testing and lean startup principles are understood by the people we meet, but far removed from how they work. Often, they experience months of analysis and a strong recommendation, only to be shot down by management. It is frustrating in many organizations to see the effort going into the “strategy as analysis”, while an evolving, involving, learning approach would be far more effective. The Scout is responsible for early outside development of new ideas and new networks. Attending conferences and events outside his own industry domain, he gets a peek at upcoming developments across many areas and disciplines. He is likely an avid reader of multiple sources and books. He would be comfortable hanging out at Uber Elevate Summit, Uber’s annual summit for their flying car project, without it having any significant relevance to his company’s day-to-day strategy. The Scout is adept at scouting future trends and emerging customer behaviors. He early identified the sharing economy and Blockchain as key trends with massive potential. The Scout might see the future, but he struggles to create internal interest and support. He has limited or zero mandate, funding and execution capability. The Scout suffers from limited impact, over time creating frustration and departure from the organization. The Scout is a master of seeing early trends but struggles to convert into internal action. Their roles are usually very different, as are their working methods. The Scout will often be working alone or in a very small team, allowing little ability to engage and activate the organization. The Analyst usually has a team around him, often with more analysts. Combined, they have some reach, but in reality, limited ability to influence and engage with organization. The Big System Thinker often has a larger team under her, while she personally is both visible and highly influential within the company. Often, she carries a strong vision for the future of the company, balancing the need to serve the CEO vs. becoming the thought leader herself. Finally, the Influencer uses his network for maximum effect. He might build and operate formal, active strategy networks internally, creating strong reach across the strategy discipline. Equally important is his informal, invisible networks at all levels of the company. He might not push his vision for the company, but through his strategic questions and re-framing of key issues, he actively helps shape the future. In our work with Strategy Officers and their strategy teams across multiple industries, we are often perplexed by the lack of tools they have at their disposal or they choose to use. Through our seven-year R&D project, Strategy Tools.io, we have developed an open source suite of 15+ strategy & innovation tools. A large part of our work has been understanding the context, need and developing the right tool for the job. What we have seen, first-hand, is the effect of having the right Strategy Tools for the job. The Strategic Innovation Canvas can be applied in multiple ways. First and foremost, it is a great conversation starter on the overall strategic priorities of the firm. Built around the classic Three Horizons, the canvas forces a strategic discussion on short-term vs. long-term thinking. With a good facilitator, the canvas frequently kick-starts a wide strategy review, opening mindsets and perspectives to a much welcome, more expansive strategy thinking for all participants. The Industry Shifts Map lets groups and individuals map out and better understand industry-level changes and the company’s ability to successfully respond. Columbia Professor Rita McGrath emphasizes the importance of grasping industry level strategic inflection points, something we likely to see at an accelerated pace in the coming decades. The Map can create a shared understanding of important shifts, in turn driving new strategic thinking. We recently hosted the CEO of a global services company, based in the US, with operations around the world. Taking him through the Industry Shifts Map helped clarify and visualize the level of change coming within his industry, and at the same time revealing how poorly equipped his firm was for the impeding shifts. He had widely read and reflected on these issues, but working through the Map by himself cemented the coming changes in a clear and visual way. The Strategy Intro is often our baseline, entry level Strategy Tool. For Analysts, it gives a basic framework to balance current core business, new growth and exploring future growth areas. With the right KPIs in place, the Analyst can delight in the Strategy Intro framework. The important thing here, is being able to balance current core with exploring new growth. For most Analysts, this is challenging; most numbers, financial figures and good data is historical in nature, making any future or internal seed projects seem small and insignificant. Yet, successful transformations have taught us to strive for the optimal balance between legacy core and next, potential core areas. With the Strategy Intro, even the Analysts have a tool supporting this ambition; balance today for new growth tomorrow. The Market Opportunities Canvas gives the Scout a one-page framework for mapping, grasping and communicating emerging trends that might provide new, strategic market opportunities. Whether from global megatrends, new technologies or customer needs, the tool allows a simple framework for grasping emerging opportunities. The Market Opportunities Canvas is a easy-to-use tool for Scouts in any type of organization. Whether you are an aspiring young strategy manager or an experienced influencer, one thing seems certain; the role of the Strategy Officer is rapidly evolving. For companies experiencing increasing levels of industry changes, new business model innovations from well-funded startups or a massive industry convergence, the role of the Strategy Officer is set to grow ever more important. Driving faster organizational agility, bringing new strategy tools to the job, growing a high-impact portfolio of strategic initiatives, setting up new venture CompanyX-unit and implementing strong M&A capabilities around future needs; the expectations are only set to rise. Which role do you play the most as the strategy officer? Share with me your thoughts and comments below. Christian Rangen is a strategy & transformation advisor to top management, boards and strategy teams. His clients range from Malaysia, Middle East and Europe. He is Co-Founder of Engage // Innovate, a strategy & innovation consulting company and Strategy Tools.io – the modern strategist’s toolkit. He is management educator and faculty at BI – Norwegian Business School. His recent projects include Malaysian Innovation Superclusters, Corporate Innovation Bootcamps and Accelerating National Transformation projects.